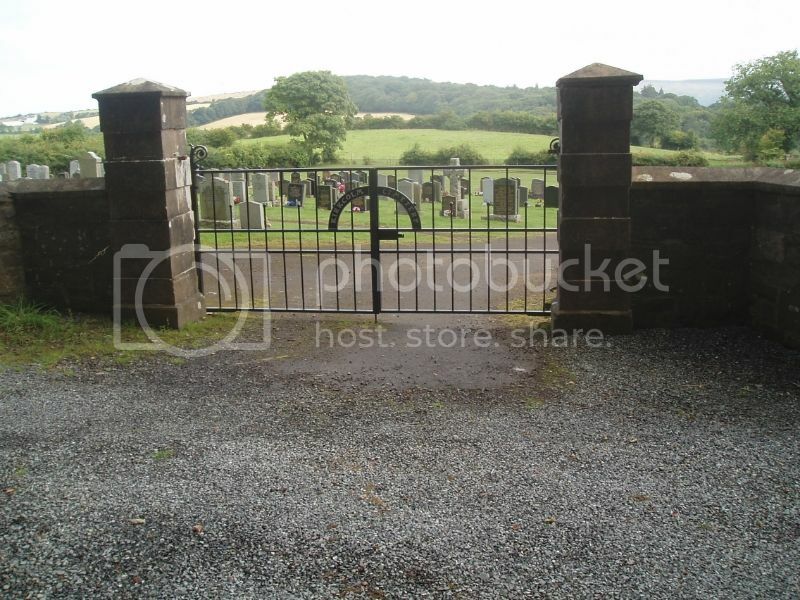 Kirkcolm Parish Church is located in the village: Grid Reference NX 02713 68692. 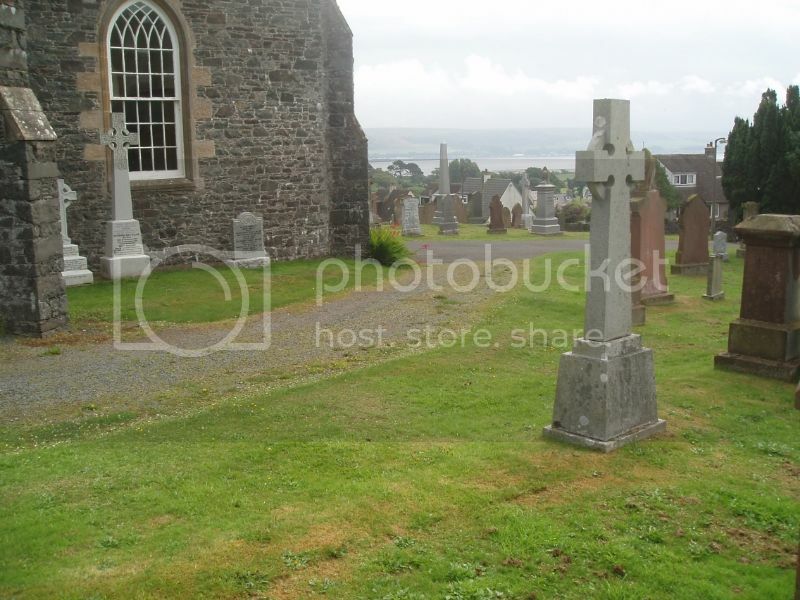 It was amalgamated with Ervie United Reform Church in 1950 to become "Ervie-Kirkcolm Parish Church". From Stranraer enter the village and turn right up Church Road. 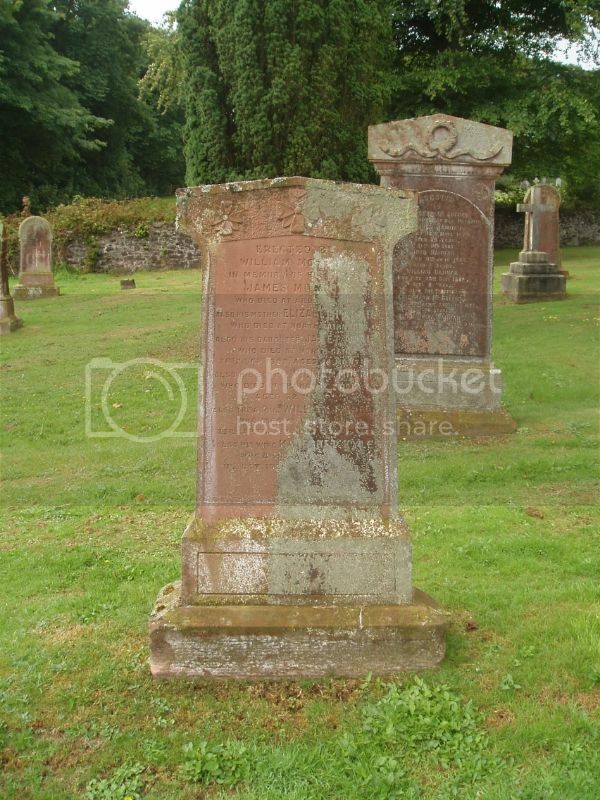 Most of the inscriptions are taken from the kirkyard but some are from the adjacent cemetery which can be accessed by going a further 50 yards up the hill and turning right up a short access road. Wigtownshire Free Press (11 April 1918): Killed in action on 26th ult Gunner James Osborne Baillie, RFA, beloved husband of Grace Nevile, Aldouran Bridge, Leswalt, aged 37 years. 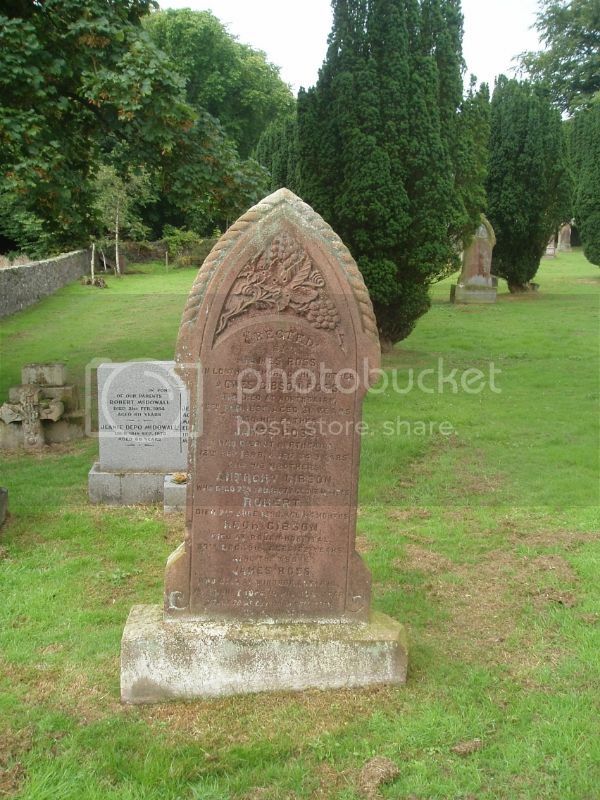 Additional Information: Son of William and Agnes Baillie, of Whitburn, West Lothian. HMS Cornwall was a County Class Heavy Cruiser sunk, along with HMS Dorsetshire, by Japanese dive bombers 200 miles from Ceylon. 424 men from both ships were killed and 1,120 survivors spent hours in the water. Wigtownshire Free Press (20 May 1915): At Stranraer JP Court yesterday - Mr John Cameron on the bench - William and George Espie, privates in the RSF were charged with having on Tuesday, in Main Street, New Luce, behaved in a violent and threatening manner, cursed, swore, and created a breach of the peace, and also assaulted John Copland, Glenluce, and Daniel Wilson, Stranraer, and the police constable while in execution of his duty. The accused, who had both been previously convicted, pleaded guilty. The P-F (Mr JM Rankin) said it was a very bad case of breach of the peace and assault, and particularly of assault against the officer, who had to get assistance to protect himself and vindicate the law. Accused were both the worse for drink, and the reason for the outbreak seemed to have been that they were refused drink at the inn. 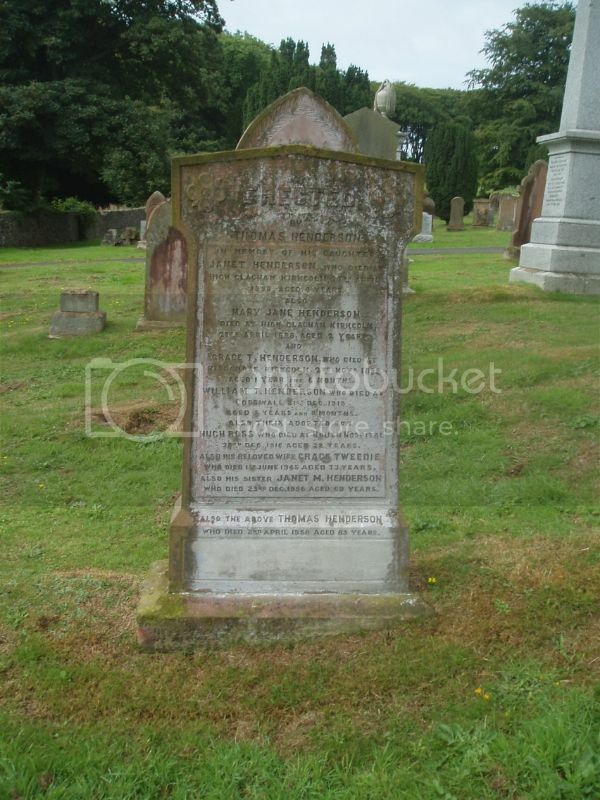 Under the circumstances he would have asked for a severe sentence, but as the men were both members of the RSF Regiment, stationed at Paisley he asked that a lighter sentence be imposed upon them, so as to enable the military authorities to be communicated with. Accused were each sentenced to five days imprisonment. Wigtownshire Free Press (30 August 1917) carried a photograph of Pte Espie: Mrs George Espie, Kirminnoch, Ervice, has received official notice that her husband, Pte G Sproat Espie, RSF, was killed in action on July 31. Private Espie enlisted shortly after the outbreak of war, and had been over 18 months in France. 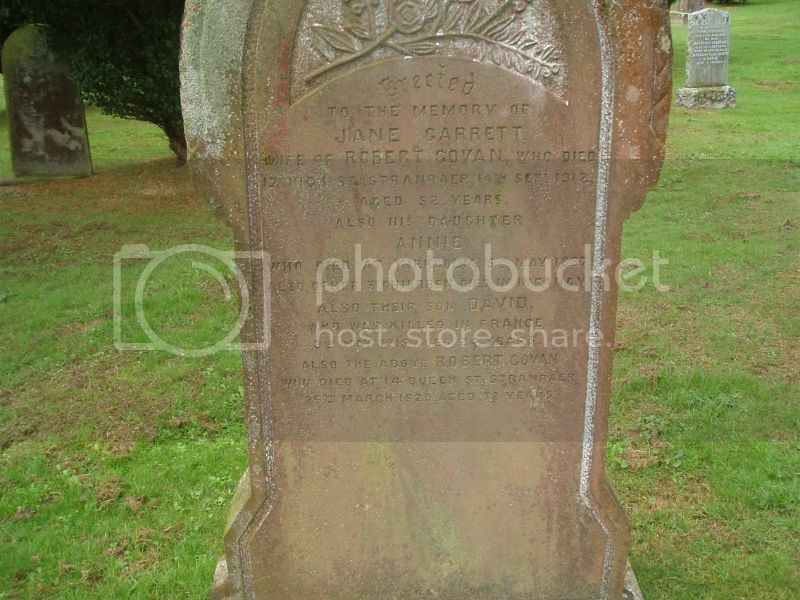 Additional Information: Son of Robert Govan, of 14, Queen St. Stranraer, Wigtownshire, and the late Jane Govan. Wigtownshire Free Press (9 March 1916) carried a photograph of Pte Govan: Mr Robert Govan, Queen Street, Stranraer, has received official intimation from the War Office, regarding the fate of his son, Private David Govan, 1st Black Watch, who took part in the Battle of Festubert, and has been missing since May 9th 1915. The letter states "that no further news having been received relative to Private D Govan, who has been missing since 9th May 1915, the Army Council have been regretfully constrained to conclude that he is dead, and his death took place on 9th May." Private Govan enlisted in the Black Watch on 1st December 1914, and after a period of training went with a draft of his regiment to France in the beginning of April 1915. The only letter received from him was to the effect that he had landed safely. 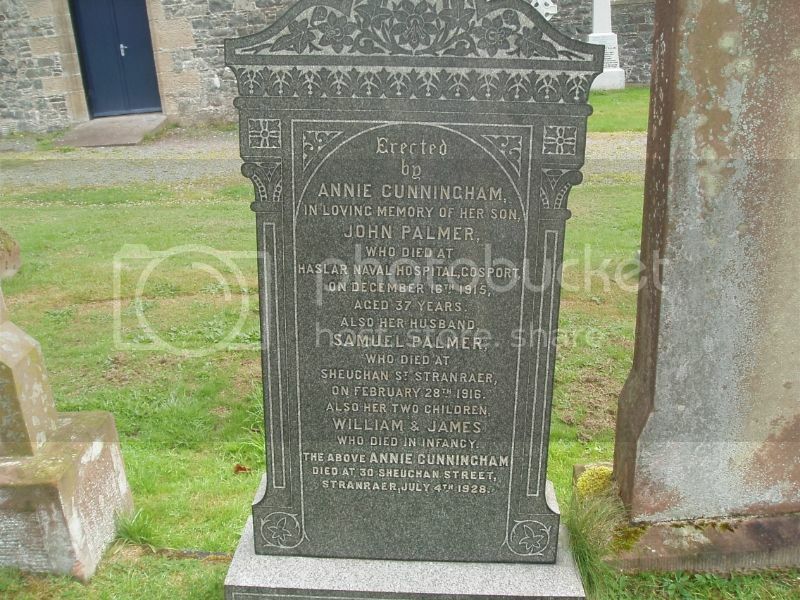 His regiment took part in the Battle of Festubert early in May, and his relatives and friends in Stranraer concluded that he had fallen in action. Endeavours were made to find out any particulars, but these proved futile; the authorities know nothing whatever about his fate. 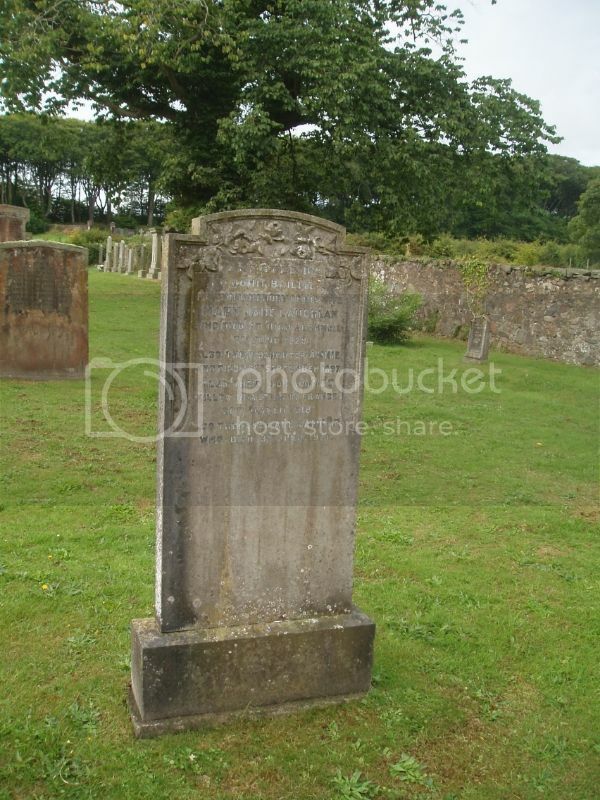 Private Govan was well known in Stranraer, and was held in high esteem by all who knew him. 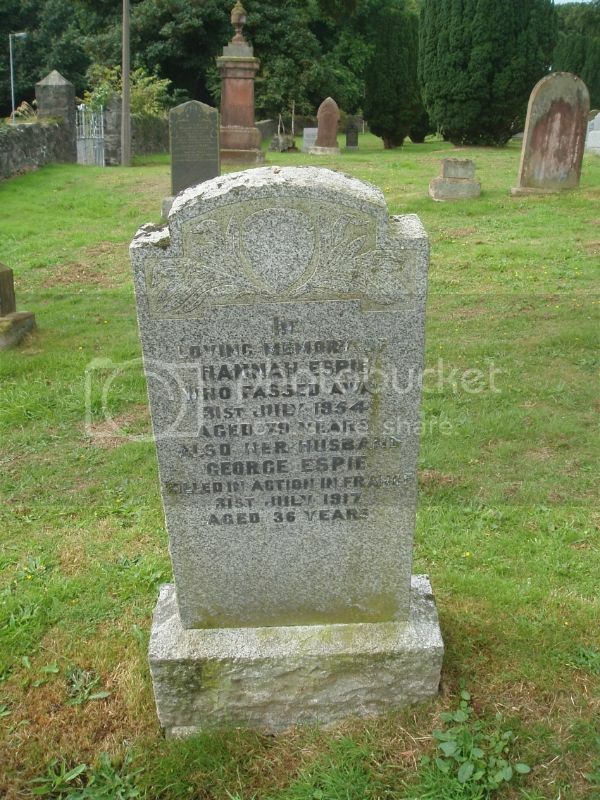 He was employed for some time at Wigtownshire Creamery and when war broke out he was in the locomotive department at Stranraer Railway Station. 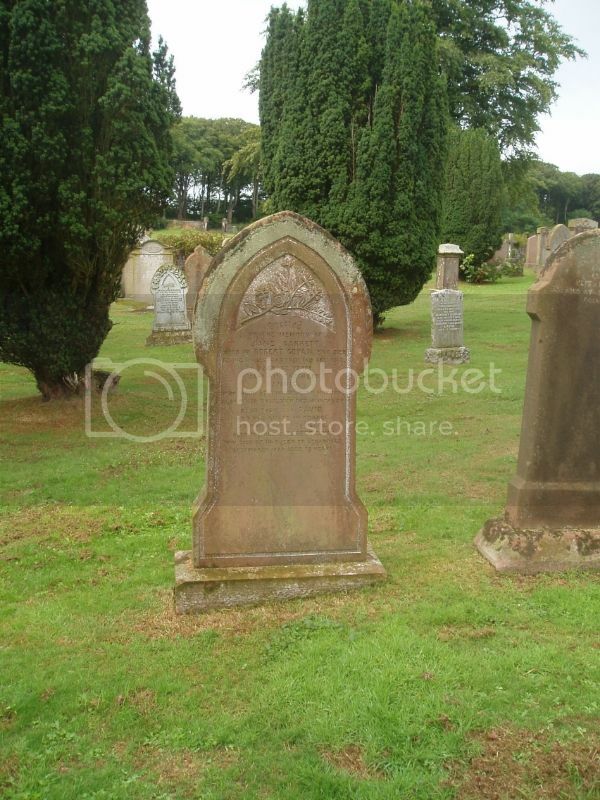 He was an enthusiatic footballer and played the game in connection with the Junior League at Stair Park. Another brother, Captain William Govan, is also in the Black Watch, and is at present in training in Richmond. Much sympathy is expressed for Mr Govan and family in their bereavement. Wigtownshire Free Press (17 May 1917) carried a photograph and reported: Mrs McGibney, Kirkcolm, has received intimation from an Army Chaplain that her son, Lance-Corpl Hugh McGibney RSF, died in hospital in France from wounds received in action. He enlisted in November 1914 and went to France the following May. Lance-Corpl McGibney had been twice previously wounded. 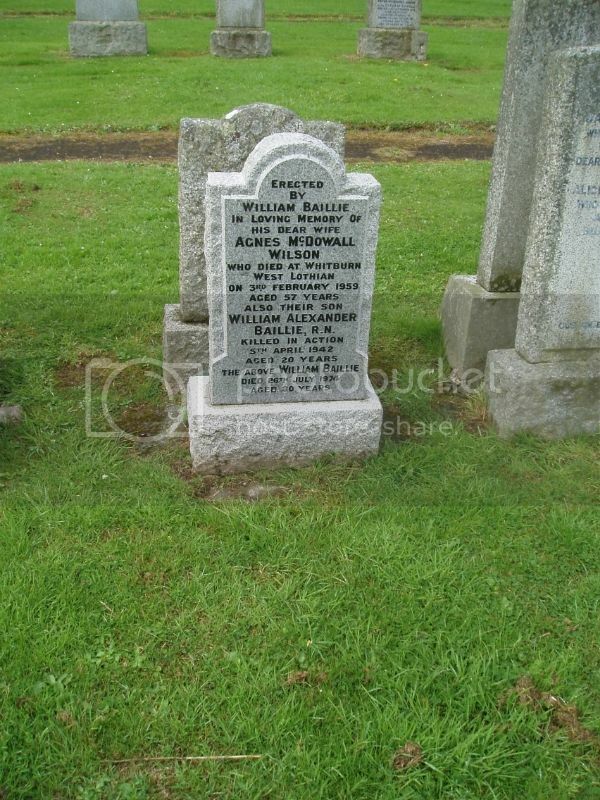 Wigtownshire Free Press (19 December 1918): Died at Base Hospital, France, on 18th October, from wounds received in action, Pte William Morrow, A Coy, 159th Int American Expeditionary Force aged 32 years third and beloved son of William and Margaret Morrow, Weirston, Kirkcolm. Wigtownshire Free Press (23 December 1915): At Haslar Naval Hospital, Gosport, Hampshire, on the 16th inst, John Palmer, beloved son of Samuel and Annie Palmer, aged 37 years. 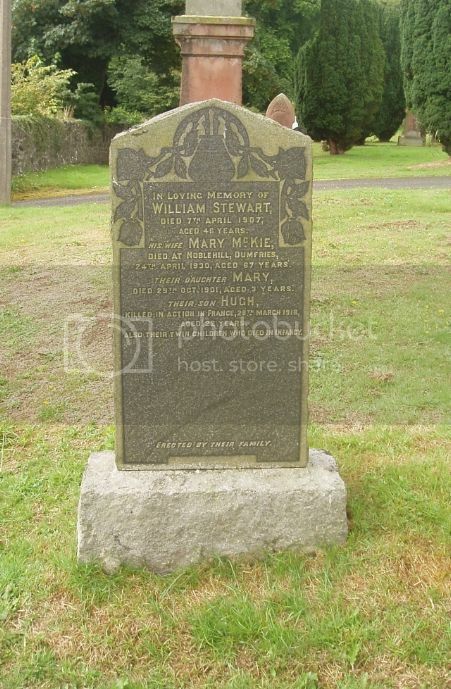 Also named on Stranraer Burgh and Sheuchan Parish Church War Memorial. Wigtownshire Free Press (4 January 1917): At Rouen, France, on the 30th December (of appendicitis), Pte Hugh Ross, Cameron Highlanders, (Late of Corsewall, Kirkcolm), aged 22 years. Wigtownshire Free Press (11 January 1917) carried a photograph: Mr and Mrs Thomas Henderson, Corsewall, have been informed that their adopted son, Private Hugh Ross, died at Rouen Hospital, France, from appendicitis on December 30th. Private Ross, who was 22 years of age, joined the Cameron Highlanders on May 30, 1916, and had served four months in France. Before joining the Army, he was employed by Mr C McKay, Kirronrae, as a dairyman's assistant. 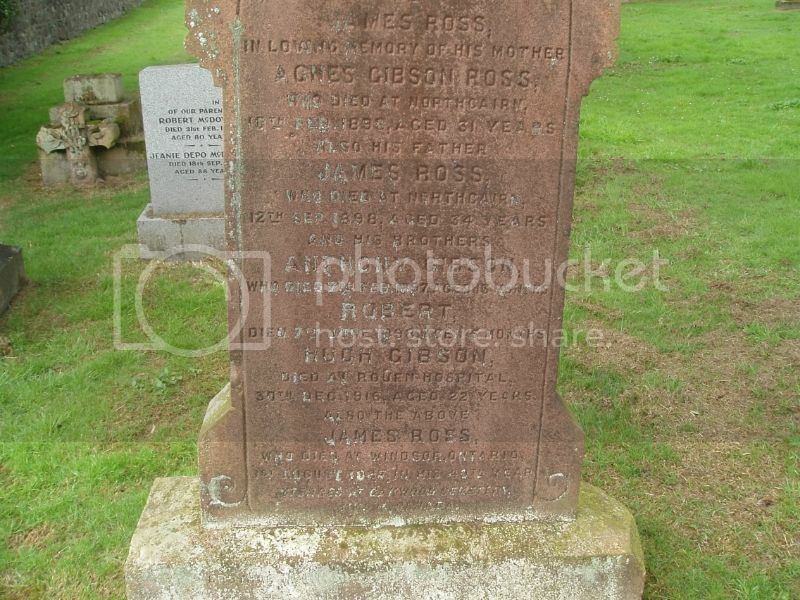 Interestingly, Hugh Ross is commemorated on two grave stones: one of his birth family and one of his adoptive family. 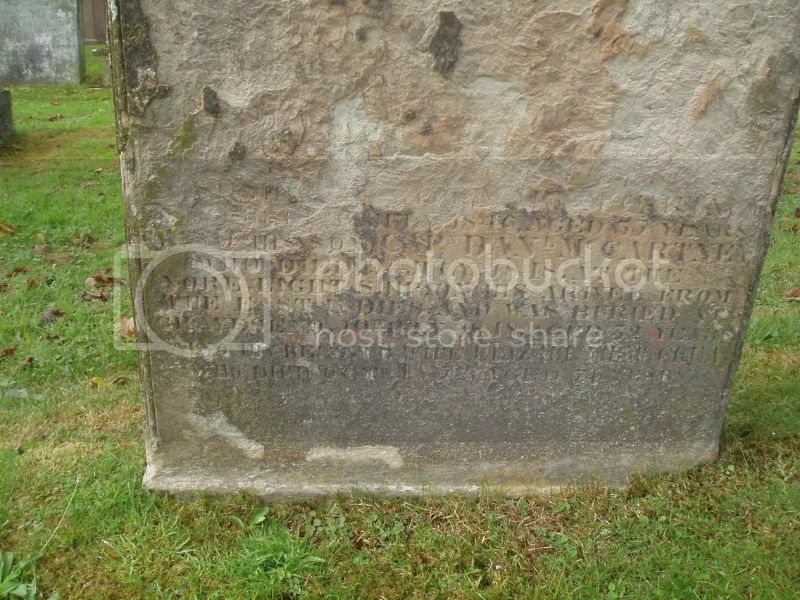 An examination of the inscriptions of the stones reveals a sad story. 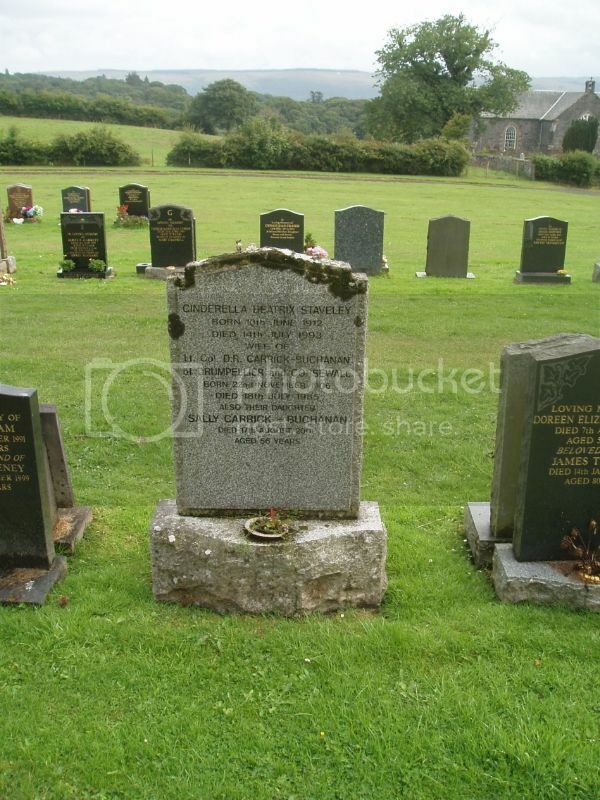 In the space of 18 months Hugh, then aged about 4, lost both his parents and two infant siblings (a 13 month old brother in February 1897, his mother in February 1898, a 5 month old brother in June 1898 and his father in September 1898). 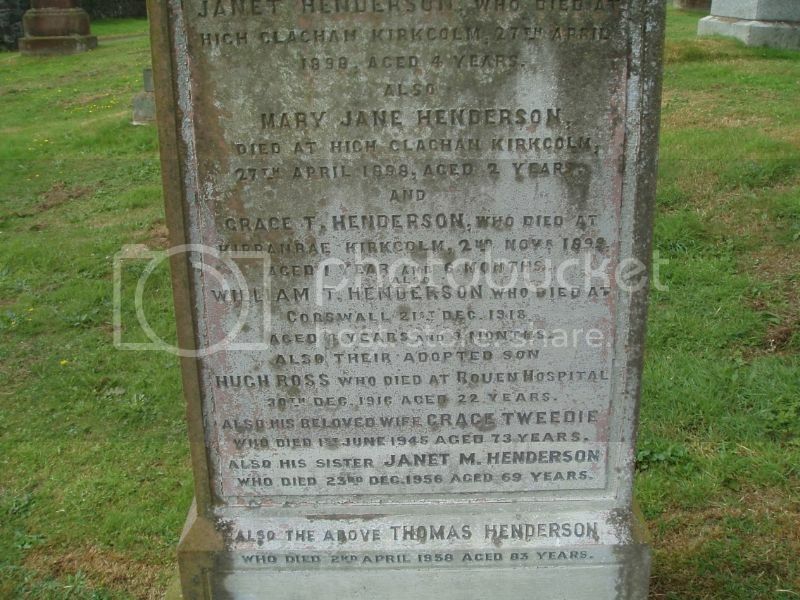 His adoptive family, the Hendersons, had lost three children at the same time: a 4 year old and a two year old on the same day in April 1898 and a 18 month old in November 1899. 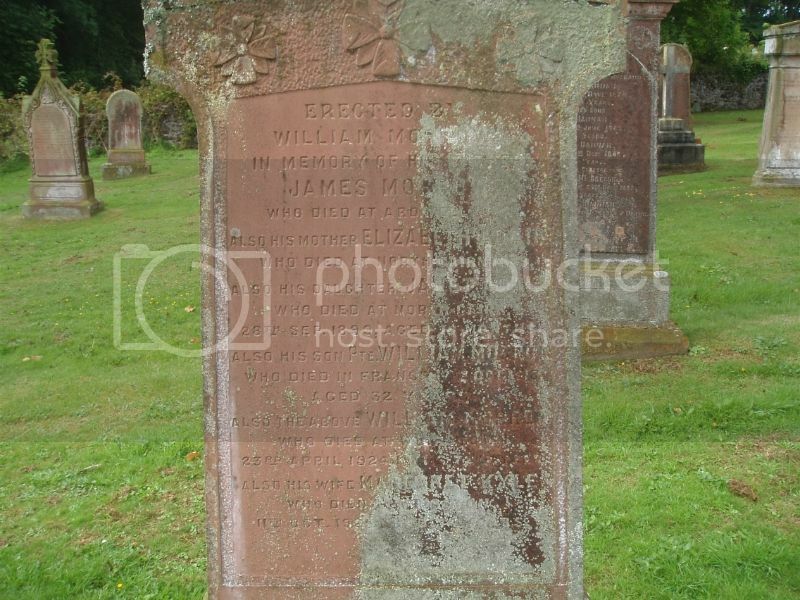 Additional Information: Son of Mrs. William Stewart, of "Relief," Ecclefechan, Annan, Dumfriesshire. Wigtownshire Free Press (6 September 1917): Mrs W Stewart, Kirkcolm Village, has been informed that her son, Pte Hugh Stewart, RSF, was wounded in action on 22nd ult, and is at present in hospital in England. Before enlisting in 1915, Pte Stewart was employed by Mr McGibney, Knockman, as assistant dairyman. This is the third occasion that Pte Stewart has been wounded. Wigtownshire Free Press (18 April 1918): Killed in action on 28th March, Pte Hugh Stewart, RSF, eldest and beloved son of Mrs Stewart, Kirkcolm Village, aged 22 years - Deeply mourned. Wigtownshire Free Press (16 August 1951): News of the death of Flight Lieutenant Alexander Hannay, Greengate, Stranraer, in a crash following a mid-air collision between a bomber and a fighter at Hudswell, near Richmond, Yorks, on Monday, was received with deep regret in the town and district. Flight Lieutenant Hannay was the only son of the late Mr and Mrs William Hannay, Corsewall Mill, and after distinguished service in the RAF during the war, he rejoined the service some two years ago. He had just returned from a holiday on the Continent with his wife and family, a small son and daughter, and was making his first flight after rejoining the unit when the accident occurred. Flight Lieutenant Hannay was in an old type Wellington bomber which carried a crew of seven, and the fighter machine was a two-seater Miles Martinet I carrying a passenger and pilot. Only one airman - from the Wellington - survived. The collision occurred ten minutes after the planes took off on a training flight. Prior to the war Flight Lieutenant Hannay responded to the call for Territorials and joined the local detachment of the 5th KOSB at Stranraer along with two cousins, Captain Andrew Hannay, and Lieutenant RAC Hannay. Shortly after the outbreak of war he transferred to the RAF and in 1941 he was severely injured when the training machine of which he was a member of crew crashed. He received severe facial injuries and was in hospital for several months. On his return to duty he again took part in active operations and in 1944 he was shot down in the Channel and taken prisoner by the Germans. He was subsequently released by the Russians and repatriated to this country. On his discharge from the RAF he returned to his civil occupation as a director of the firm Messrs R and A Hannay Ltd. He never lost his love of the air, however, and rejoined the RAF in 1919. During his short term of civil life he was an active member and office bearer of the RAF Association and was subsequently appointed officer commanding the Stranraer Squadron of the ATC. When he resigned from that position to take up active service once more he was presented gifts from the corps. Flight Lieutenant Hannay, who was familiarly known as "Bob" had a frank and engaging manner. Among his recreations was golf. 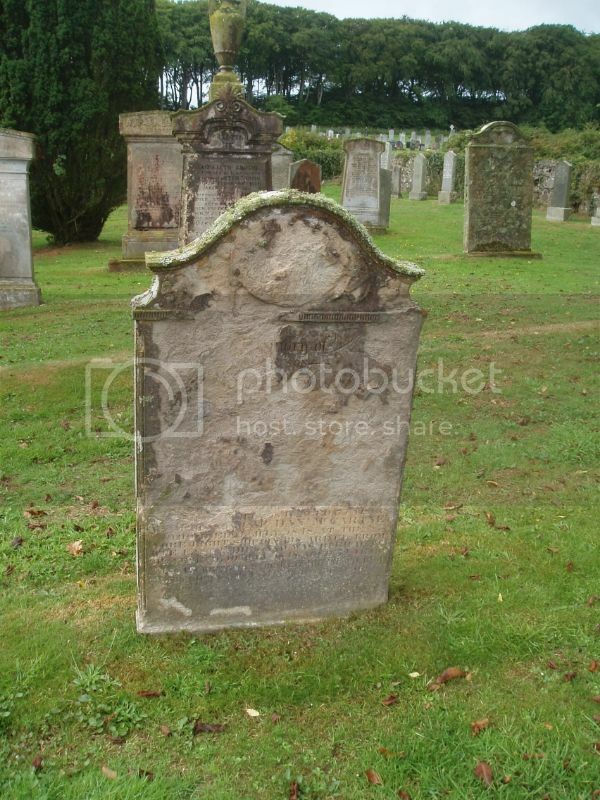 He was a member of the Dunskey Club where he was a firm favourite though his appearances were not so frequent as he would have wished. 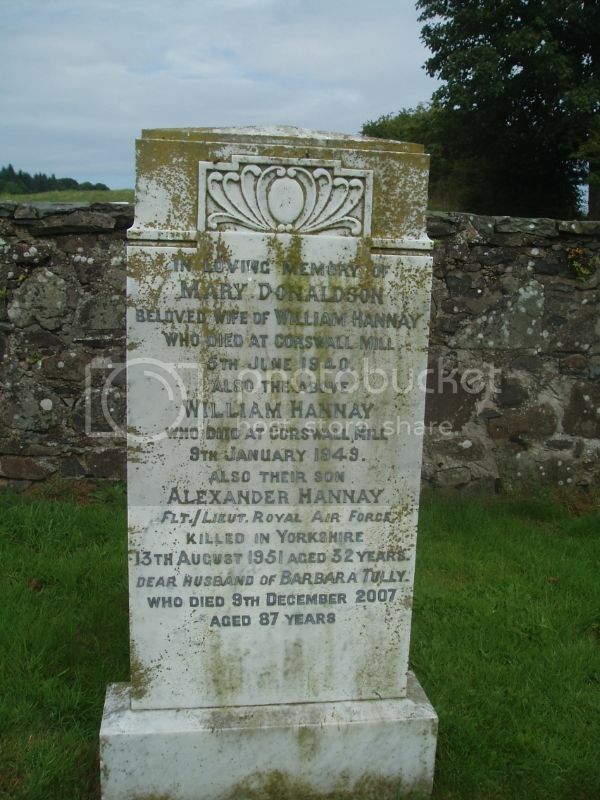 His father, Mr William Hannay died in 1948, and in addition to his widow and family Mr Hannay is survived by his sister, Mrs Douglas. 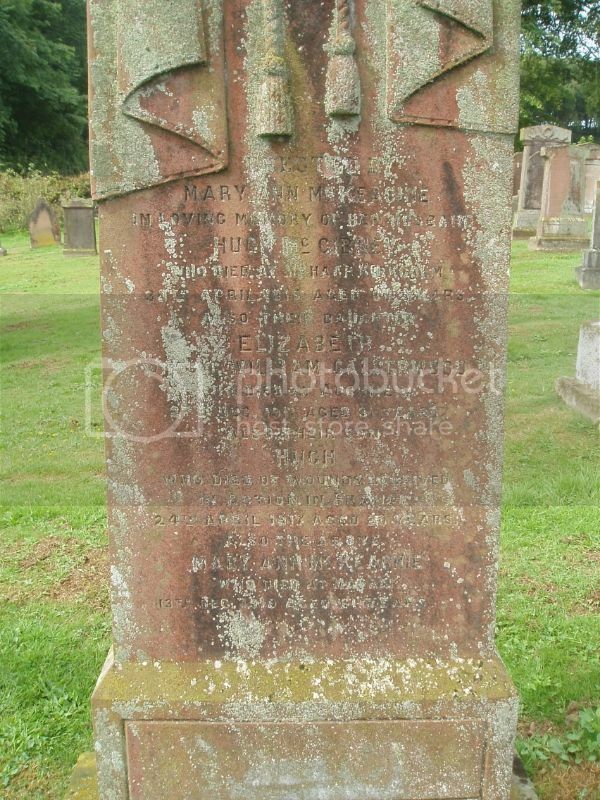 Flight Lieutenant Hannay was a descendent of one of the oldest families in Galloway being able to trace their family tree back to 1296. 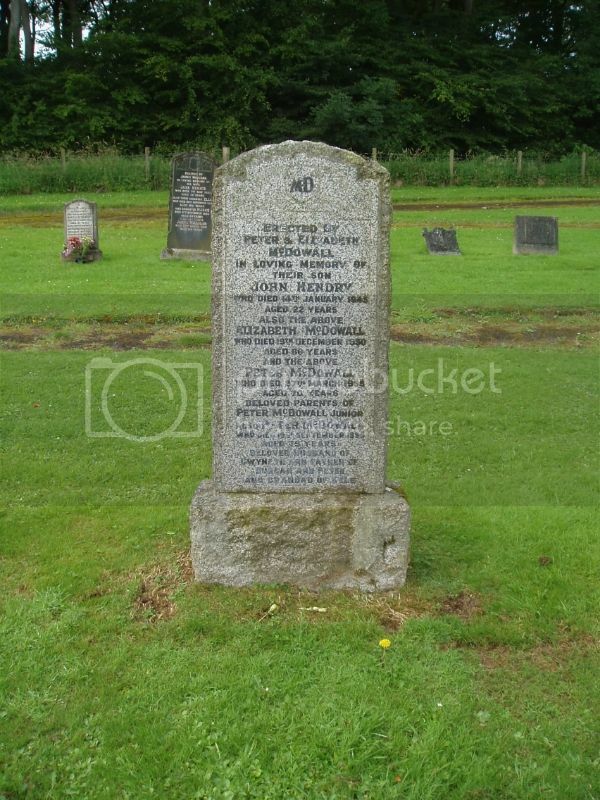 Wigtownshire Free Press (18 January 1945, Births, Marriages & Deaths): McDowall - At Kirkcolm, on January 14th 1945, after a long illness, John Hendry (RAF) younger son of Peter and Elizabeth McDowall, in his 22nd year. Not on CWGC so, presumably, the illness was not related to his service. 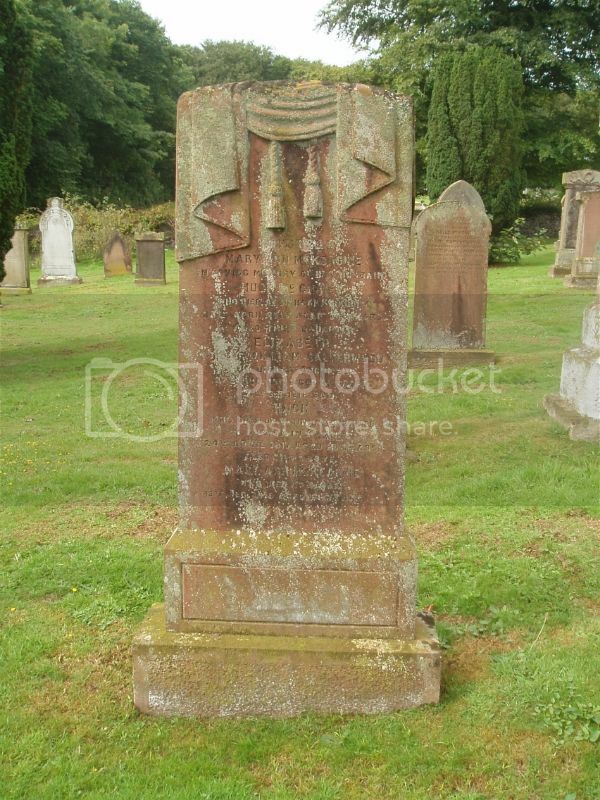 Relevant part of inscription reads: ... his son Capn Danl. 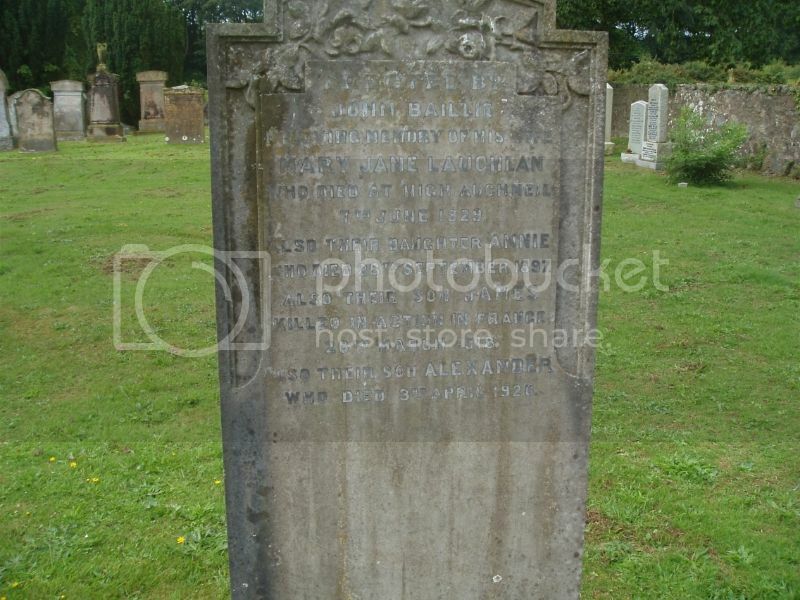 McCartney who died 9th July 1848 at the Nore Light Ship on his arrival from the East Indies and was buried at Gravesend 10th July 1848 aged 32 years.